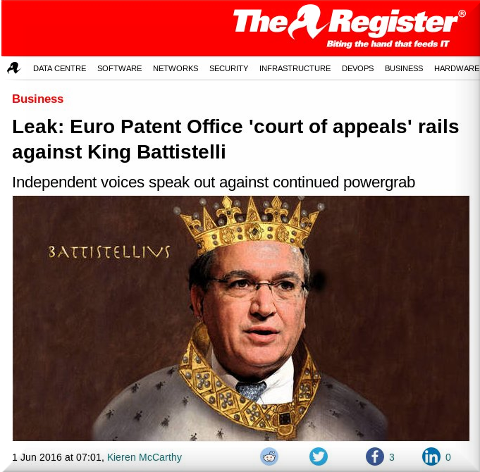 Battistelli is off the rails again. His defamation campaign against a judge must apparently remain a closely-guarded secret, unless he controls the media and issues defamatory pieces just weeks after signing that infamous (and secret) FTI Consulting contract. We covered that last year. –AnonymousAs we noted last week, a very small room was chosen, presumably by intention (to discourage public participation). Is this finally (hopefully) the last straw that would lead to the sacking of Battistelli in 2 weeks? Remember how he also bullied delegates (Administrative Council). That was last year. How much more of this can Mr. Kongstad tolerate? As Board 28 put it, there is now a "crisis" and the entire Organisation, not just the Office (both are called EPO), risks collapse. The main question at this stage is, has any of those attending brought a recording device and, if so, will that person share the audio with the press/bloggers? If only one blogger is present, then it’ll be easy to witch-hunt/punish that person. This is probably what Battistelli and his goons want. It’s also quite likely the reason a very small room got allocated at the 90th minute, in spite of Room 131 (which is also not that big) being available/reserved. Eponia is quite a crazy place and Battistelli wishes to make it even crazier. So much for fair ‘trial’ (or hearing). What is Battistelli so afraid of? To most people it’s a rhetorical question.